It is the last day of week 6 and I finally plugged all the weights and measurements into a spreadsheet I used for previous workouts and got some hard facts. I’m a measurement nut, so I like as much data as possible. I weight myself everyday and my scale tells me weight and percent body fat. I know those scales aren’t perfect, but if you do it at consistently the same time every day they should give you accurate trend data. I do it first thing in the morning after I pee. I also measure myself with a tape measure every Monday. Chest, belly (at the belly button), waist (narrowest part of my torso), hips (where my belt goes), thigh, and neck. This lets me calculate Waist to Hip, Waist to Chest Ratio, and a Body Fat measurement for men that the Navy uses with just measurements. I also added BMI. Given all that data, here’s some results. Total weight loss: 8.6 lbs so far. Percent Body fat loss: 2%. This means I’ve lost 6.37 lbs of fat and 2.23 lbs of lean body mass. I’d rather have not lost muscle, but I feel stronger, so I’m not sure what that means. 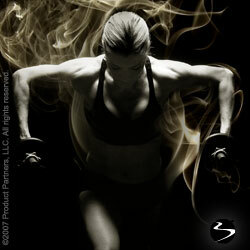 Strength increases can be caused by muscle recruitment, which means you are using the muscle you have more efficiently. My muscles are also harder for what that is worth. Lost an inch in my belly and chest and lost .65 inches in my waist and 1/2 an inch on the belt line. My BMI has gone from 27.07 to 25.94. According to the linked website, you are overweight if your BMI is 25-29. So I’m right on the edge of “normal”. My spreadsheet also projects using the average loss and number of weeks left in the challenge. It says at the end I’ll weight 188 and my percent BF will be 24.1. So things are working, but I’m still thinking about changing my diet. I don’t feel like I’m getting enough to eat because I’ve started being hungry all the time. I’m thinking about going low carb – which P90x tells you to do from the beginning if you want to get lean. Of course I’ve become so accustom to entering my calories I might freak out if I started entering higher calorie things. I haven’t decided yet, but I want to be leaner in 3 weeks when I go to Vegas. I’m sure we’ll be at the pool and I’m not shirtless ready yet. Previous Previous post: Opening/intro/attention music is sweet home Alabama instermental. Next Next post: My new 10 minute commute means I don’t have as much time for podcast listening. Or audio books. Have to narrow those down.